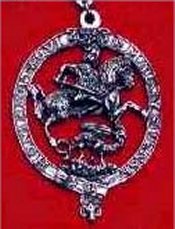 The Most Noble Order of the Garter is the premier order of English Knighthood. Membership in the order is the highest honour which the Sovereign can bestow. The order consists the Sovereign and twenty-five Knights. 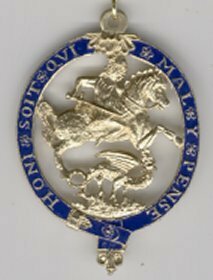 The pendant was introduced in 1521, featuring St. George slaying the dragon encircled by a buckled garter bearing the Latin motto of the order: Honi Soit Qui Mal Y Pense (Evil to him who thinks evil of it). When the pendant was not worn on the collar (as pictured), it was worn hung from a gold chain in the early reigns, but by the reign of Elizabeth I it was hung around the neck on a black or, later, a sky-blue ribbon about 3 inches in width. Two finish options are available: Pewter or Gold-Tone Pewter (Enamel & Lacquer) (add $10). Ambitious customers can use enamel paint to paint the riband blue, as pictured on the right. The pendant is not available with a painted riband, we illustrate it here to show what you can do to the pendant.